David Huerta wrote “Ayotzinapa” on November 2, 2014, “in anger, outrage, and horror.” It has already formed an installation at the Oaxaca Museum of Contemporary Art, been printed by Juan Nicanor Pascoe’s letterpress, and been read and excerpted in protest banners from Berlin to Xalapa. When I read it two weeks ago, I realised there was a very practical way for Asymptote, as a journal of international literature, to communicate Mexico’s rallying cry for change and justice in multiple languages. Juana Adcock’s English translation was the first in a chain that now stretches from Mexico to Scotland, China, Romania, Israel, Indonesia, Brazil, Greece, and beyond. 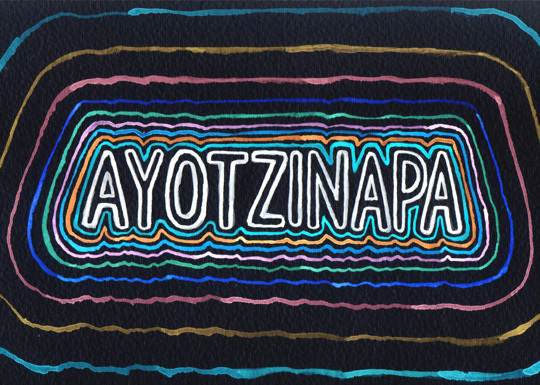 Asymptote’s global “Ayotzinapa” has become a poetic event, an audible coming-together, which is one constructive way of responsibly renewing the word Ayotzinapa, as Valeria Luiselli suggests we must do in her introduction to the poem. All of the translations begin with the same, untouched word, Ayotzinapa; like David, all of our translators took pains to get across—rephrasing the Greek poet C. P. Cavafy—what these Ayotzinapas mean. It is perhaps hard to say why Ayotzinapa, in particular, has resounded with such force in Mexico where, in the last years, there have been more than 25,000 “disappearances” and many, many more deaths. There are a few other words in the Mexican collective imaginary that resound similarly: “Ochenta y cinco,” (the 1985 earthquake, which killed more than 10,000), “Tlatelolco,” (when in 1968 the army fired against and killed student protesters in Mexico City’s Plaza de las Tres Culturas) and “Acteal,” (when in 1997 paramilitaries massacred 45 men, women, and children who were attending a mass—two days before Christmas). Less than three months ago, Ayotzinapa was a word unbeknownst even to most Mexicans that now has come to signify perhaps more things than the word itself can bear. For many, Ayotzinapa is now synonymous with “state crime”—and the degree to which the state is seen as involved in this and other crimes varies from “absolutely” to “partly.” The gray area in between is what drives most of us insane with uncertainty. For most Mexicans, Ayotzinapa is also a metonym for the ongoing disappearances and deaths related to drug wars and state corruption and crime. It is, likewise, a more general metaphor for the situation Mexicans have faced, tried to ignore, and then faced again over these past years, like a nightmare from which they cannot wake. But it is as much an abstract metaphor and metonym as it is a fact, the concreteness of which comes down to the faces of 43 young men who were killed by orders of a mayor; 43 students preparing to be rural teachers who were then burnt to ashes and bits by members of a cartel, Guerreros Unidos. Burnt and “disappeared” by men whose degree of evil can only be explained, as Hannah Arendt wrote in the context of the trial against Eichmann in Jerusalem, if we come to understand evil as banality. It is hard, but perhaps not so hard, to explain why Ayotzinapa is the straw that broke the camel’s back. Ayotzinapa is like one concrete symptom of a larger, invisible illness; or the illusion of a grip in a situation that seems insurmountable. The reaction to Ayotzinapa has without a doubt marked a turning point in the way that Mexican society has collectively decided to face, oppose, and attempt to produce a change in the way the country is being governed—or ungoverned. It has also marked a turning point in the degree of involvement of civil society outside Mexico. Much more than a few months of demonstrations, for those in Mexico, or hashtags and other means of virtual protest for those outside will be needed to really produce a structural, significant, lasting change. But the concern of individuals worldwide is a beginning, a real one, and it is up to everyone who has been involved in one way or the other to remain involved and not let this pass, to not let Ayotzinapa fall back into the well of unfathomable, forgettable foreign words. I believe that Ayotzinapa was a state crime, in so far as municipal police perpetrated it, a mayor gave the orders, and it possibly involves other members of the Mexican government in direct and/or tangential ways. I believe, moreover, that it is the Mexican government’s responsibility to keep its people safe and apply the law to perpetrators of crime. But when people say that Ayotzinapa is a “state crime,” that should not, ever, be an incentive to eventually turn our heads the other way. That is what #WeAreAllAyotzinapa / #TodosSomosAyotzinapa means to me. I also believe that the small, perhaps tiny role that people who dedicate their lives to writing—in whichever sense and through whichever channels—can play is to make sure that words do not become empty signifiers, mere carcasses. One way to live up to the understanding that “despite everything/ The dead have not departed/ Nor have they been disappeared” is to responsibly renew the word Ayotzinapa in as many languages, in as many mouths, in as many minds as it will take for all this collective noise to become a source of individual clarity. That is, I think, what #WritersWithAyotzinapa / #EscritoresConAyotzinapa means. David Huerta was born on October 8, 1949, in Mexico City. He is a poet and university professor. In 2013, the Fondo de Cultura Económica published his collected works, La mancha en el espejo (The Stain On the Mirror), which brought together his poetry books from 1972 to 2011. Since 2007 he has published a monthly column entitled “Aguas aéreas” in the Revista de la Universidad de México (University of Mexico Journal). In 2010, Copper Canyon Publishing, U.S., published Huerta’s poetry anthology Before Saying Any of the Great Words, translated and edited by Mark Schafer. He was a Guggenheim fellow in 1978—1979 and has received both the Carlos Pellicer and Xavier Villaurrutia awards in Mexico. Valeria Luiselli was born on August 16, 1983. She is a Mexican novelist and non-fiction writer and the author of the book of essays Sidewalks and the internationally acclaimed novel Faces in the Crowd. Luiselli’s short fiction and non-fiction pieces have appeared in magazines and newspapers such as The New York Times, Granta, McSweeney’s, and Dazed and Confused. Her work has been translated to multiple languages, and in 2014 she was the recipient of the National Book Foundation “5 under 35” award. Translators: Mirza Puric (Bosnian); Zhuxin Zhang (Chinese); Katrine Jensen (Danish); Florian Duijsens and Caroline Ruijgrok (Dutch); Juana Adcock (English); Kasper Salonen (Finnish); Veronka Köver (French); Tsead Bruinja (Frisian); Kaye Voigt Abikhaled (German); Mikhail Mavrotheris (Greek); Yardenne Greenspan (Hebrew); Mark Baczoni and Péter Závada (Hungarian); Maggie Tiojakin (Indonesian); Enea Zaramella (Italian); Kazunori Hamada (Japanese); Lívia Lakomy (Portuguese); MARGENTO (Romanian); Alexander Hutchinson (Scots); Anne-Charlotte Harvey (Swedish). Los helicópteros van y vienen. Los restos de tantos muertos. La población los ve pasar.